In 1981 Sol was studying ceramics, sculpting and print making at Santa Barbara City College, in California. Between classes he’d watch the glass blowers working the glass. The more he watched, the more he fell in love with this art form. The spontaneity of working with glass intrigued him. He started spending more time in the studio, eventually trying his hand at it and he’s never looked back. 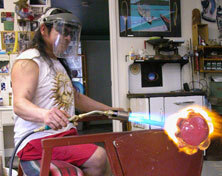 Sol eventually became responsible for the running of the glass studio at the college, a position he held for several years. Active in the local Santa Barbara art scene, Sol founded “Art for Life”, an annual event involving as many as 250 local artists. Sol’s art flows from a creative process by which he uses his own imagination to create true original artwork. The “Saturn ring” is Sol’s signature. The creation of these rings introduces a new technique to the ancient glass blowing process. He molds, with his hand and a wet pad, a ring of glass around the vessel. The ring is not added on after the vessel is blown but emerges out of the glass as one mass, one molecular structure that allows the light to travel freely throughout the piece. This is a fresh approach to glass blowing while still maintaining traditional techniques! 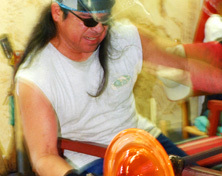 As far as Sol knows, no other glass blower before him has ever worked glass in this way and he wishes it to be his contribution to glass art. The ring has evolved over the years, becoming more refined and more consistent. Sol has developed several variations of the ring, including adding color to the ring itself and dividing the ring into four sections, which he calls “the four directions”. These are like cups that emerge from the sides of the vessel, reminiscent of the Pre-Columbian pottery, which his Mayan ancestors were known for. Sol’s latest works, the Ridgeback series (8 protrusions) and the Sunrays series (16-30 protrusions) and his new “Eagle Wings” demonstrate the evolution of the ring. Sol’s pieces react amazingly with the light. He believes the life-giving light of Father Sun puts the spirit into the rings, bending light, creating intricate three dimensional reflections, and creating energy forces in their center. Light energy brings life to the glass, makes it breathe. Some of his pieces react to the vibration of your voice and actually change color when you talk near them! Sol moved from Santa Barbara to Vancouver, B.C. Canada in 1992. He worked for several years with Elder master glass blower, David New-Small (for whom Sol has great respect) at his studio on Granville Island. 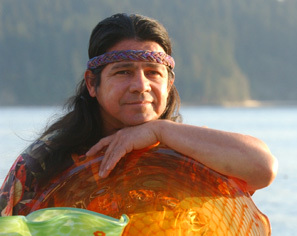 In 2001 Sol and his wife Gwen opened Solart Glass Studio at Klee Wyck in West Vancouver, B.C. The studio is located on an old estate on the west bank of the Capilano River. The estate is named “Klee Wyck” after famous Canadian artist Emily Carr. The studio setting reflects the beauty and uniqueness of Sol’s art. His work is currently displayed throughout North America from Tofino, on the far West coast of British Columbia, to the high desert of Santa Fe in New Mexico. Sol was very proud to become a Canadian citizen in 2002. In June of 2007 Sol and Gwen opened a small gallery/studio in Tofino, B.C….a magical place where the ancient rain forest meets the open ocean. They invite you to visit them there at “Spirit of the Fire”. Sol’s inspiration comes from many sources. His Native American spirituality, his love of surfing the ocean waves and his natural interest in space and the stars inherited from his Mayan ancestors, are all reflected in his work. Sol’s wish is to share his rings with the people of the world. He hopes that you will feel what he feels.